It seems that someone has determined that the key to the success of services such as Netflix has been the concept of one price for an unlimited number of uses. 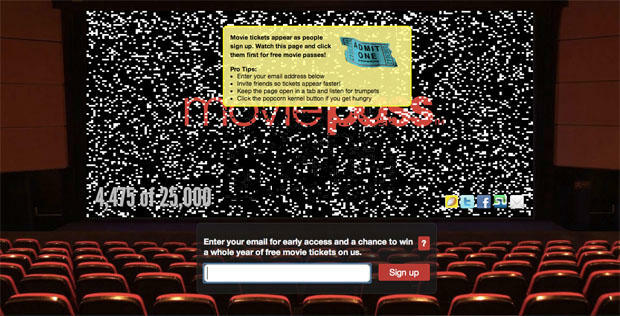 Now a new service named MoviePass is going to bring that same concept to the movie theater, but can it succeed? MoviePass is launching as a limited test in 21 theaters around the San Francisco Bay Area this weekend. The concept is you pay one price for an unlimited number of visits to a theater in a month. Using your smartphone as the interface, you look up the film you want to see and which theaters it is playing. You then reserve your ticket prior to arriving at the theater and then just proceed to the ticket taker once you arrive where they will scan your phone screen. For now it is limited to an HTML5 webpage, but it will soon be coming out as native apps for all of the usual suspects such as Android and iOS. What will such a magical ticket cost you? How does $50 a month sound? If you’re a heavy theater goes this could end up being a heck of a savings for you, but if you’re just a casual or occasional visitor to the theater, then this is definitely not for you. If you want to go to a 3D or IMAX presentation you will pay a $3 surcharge for those showings. If you don’t feel you will get enough use out of the pass, the company will also be offering a $30 pass for four showings a month. It’s an interesting idea, but when you’re looking at an investment of $600 a year for unlimited and $360 for the four-times-a-month version, it seems the company may have missed the success of Netflix and Rebox: Cheap and convenient. While this is certainly a way for some people to save money in a world where theater ticket prices have been climbing like crazy, the number of people who go to the movies enough to warrant a pass such as this has to be fairly small and a niche market. This is to say nothing of how many people feel that the quality of movies has been in decline for years, but that is an arbitrary discussion at best as it is based on individual taste. While this seems like a worthwhile pilot project, we just can’t see it catching on in the way that the afore mentioned Netflix and Redbox have. These are very different beasts, not to mention a world apart in pricing.Perhaps it will find moderate success, but we don’t see this catching on like gangbusters. What do you think? Will you give MoviePass a try when it comes to your area?